Our range of wobble pumps is the ideal solution for those seeking a highly compact and versatile product. They are particularly easy and economical to maintain, due to the very small number of component parts. They can be used in a variety of industrial applications due to their ability to pump products which are viscous, which have solids in the fluid or which are mildly abrasive. Perfect for those seeking a highly efficient, economical product, these offer an unparalleled cost/benefit advantage. Even at high rpms, they pump without pulsating and there is virtually no centrifugal effect. They are also suitable for use within the food industry, as there are no dead zones within the pump. The R series range of pumps all have solidly constructed housings in cast iron, bronze and stainless steel (AISI Type 304 and AISI Type 316), manufactured using lost wax casting technology. R Series: a highly compact product due to its integrated construction between pump and electric motor. The use of cross-joints ensures a high degree of reliability and a smaller footprint. 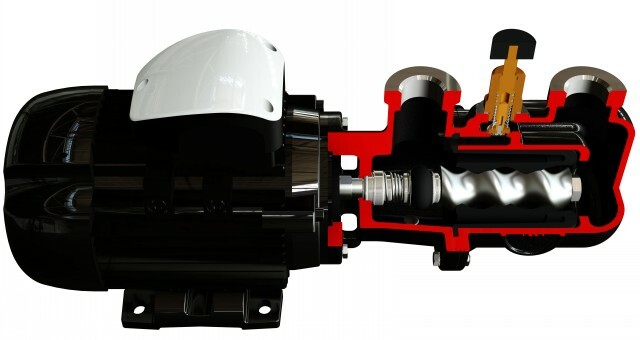 The support between the pump housing and the drive has been removed to offer the benefit of a product which is compact and easy to maintain. RF Series: this is based on the same technology as the R Series, but in contrast uses support bearings with a plug-in shaft at the inlet. The RF Series can be directly connected to the drive via a flange. The ideal solution to supply as a bare shaft pump, while still maintaining a compact size and easy installation. The bearings ensure maximum reliability in all operating conditions. 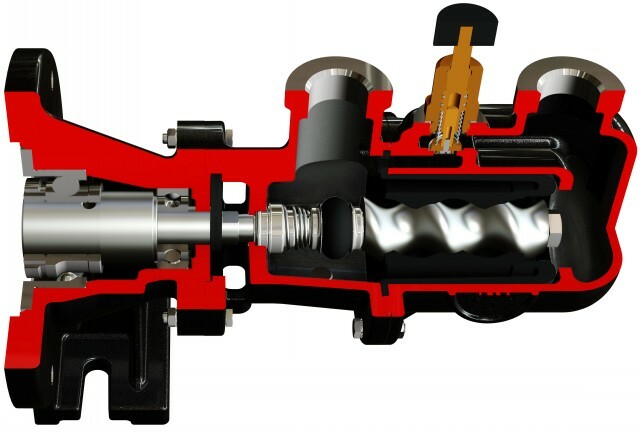 Cross-type joints, the true heart of the wobble pump, offer the best solution currently available on the market. Cast-manufactured, highly durable and reliable, due to the high degree of engineering being achieved. Its special construction allows the axial loads and torques on the two axes of rotation to be split, ensuring only rotary movements of the pins that compose it. Its smaller dimensions mean that it can be replaced quickly. The pump can be installed without a stand. This helps to reduce the overall dimensions and avoids additional costs. When necessary, stands, customized skids and trolleys can be provided, allowing the pump to be moved. The parts in contact with the product can be manufactured from different materials in the R Series pumps, from the cast iron version (GG25) to stainless steel (AISI Type 304 and AISI Type 316) to bronze. However, the cast iron and bronze versions still have the rotating parts made from AISI Type 304 and AISI Type 316 stainless steel. Very low pulsation and tensional stress. The centrifugal effect is reduced to a minimum, due to its special design and the predominantly axial pump system. 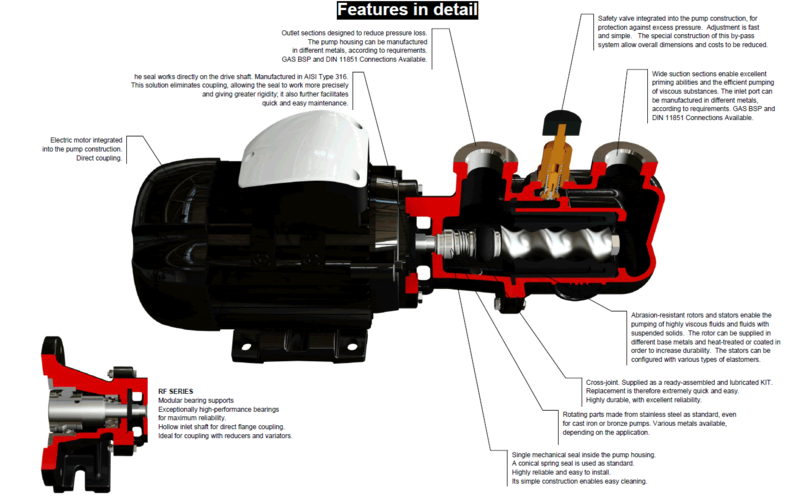 The pump uses internal single mechanical seals as standard. The seal is located inside the pump housing. This solution ensures the maximum heat exchange between the surface of the seal and the product being pumped, which gives the benefit of increased durability. Moreover, the position of the seal makes it much easier to keep clean, thus avoiding product residues that could negatively affect operating conditions. The housings are suitable for the installation of seals manufactured in accordance with ISO EN 12756. 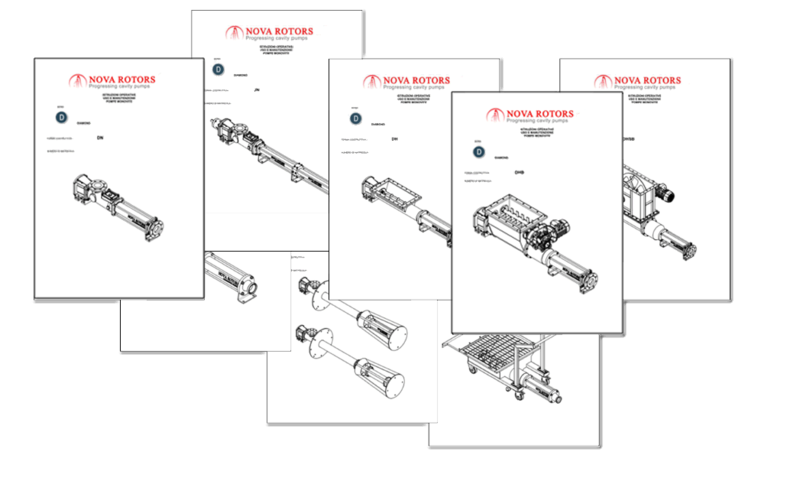 The R Series is based on a modular concept in every single feature: hydraulic parts, casings, seals, stands, supports and drive shafts. Each component can be constructed in a number of variants without modifying the structure of the machine, thus maintaining standard key replacement components. Durability, reliability and low energy consumption. The R series successfully combines a compact size with high performance in one single product. The R Series is designed to be versatile in all of its applications, which is why it can be arranged with options and accessories that are suitable for every application. In addition to this, there are the benefits that the special characteristics of a cavity pump can naturally offer in pumping various kinds of fluids, fluids with low to very high viscosity, fluids free from or containing solids of various types and sizes. All the drives installed on the R Series have been endurance-tested and have been subjected to strict and stringent technical testing. We can install either electrical or hydraulic motors. The highest possible standards, exceptional operating efficiency due to its excellent volumetric efficiency, even at high pressures, and minimal energy consumption. All the hydraulics on the R series have been calculated to ensure the best you can find anywhere on the market today. The R Series is designed to ensure easy maintenance, with only a minimum number of replacement parts necessary. In particular the cross-joint is easy to replace due to its reduced dimensions, enabling it to be completely replaced without having to replace shafts and rotors. Maintenance costs are thus reduced. 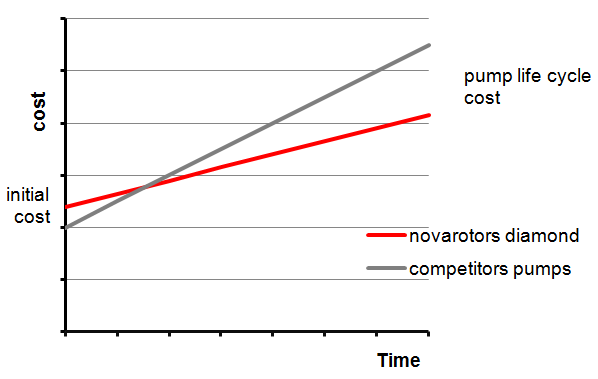 The cost of the machine is also highly competitive, considering its entire life-cycle. Easy installation: The RL Series pumps are easy to install, due to their compact size, their simplicity of operation and their operational flexibility, and the various fittings available.